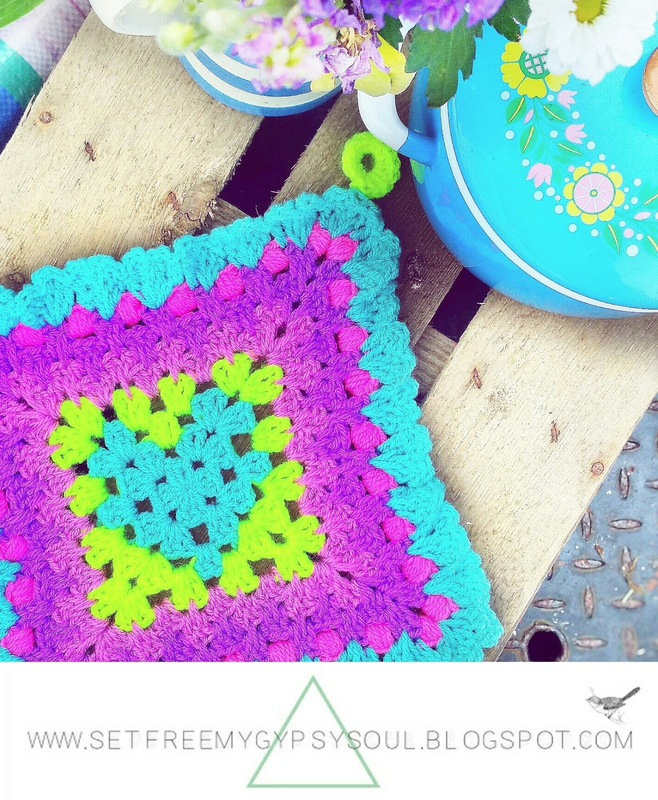 Make this cute crochet Granny Heart Pot holder with an adorable frilly heart shaped ruffle edging in no time using treble crochet (US double), spike stitch and puff stitch. First... 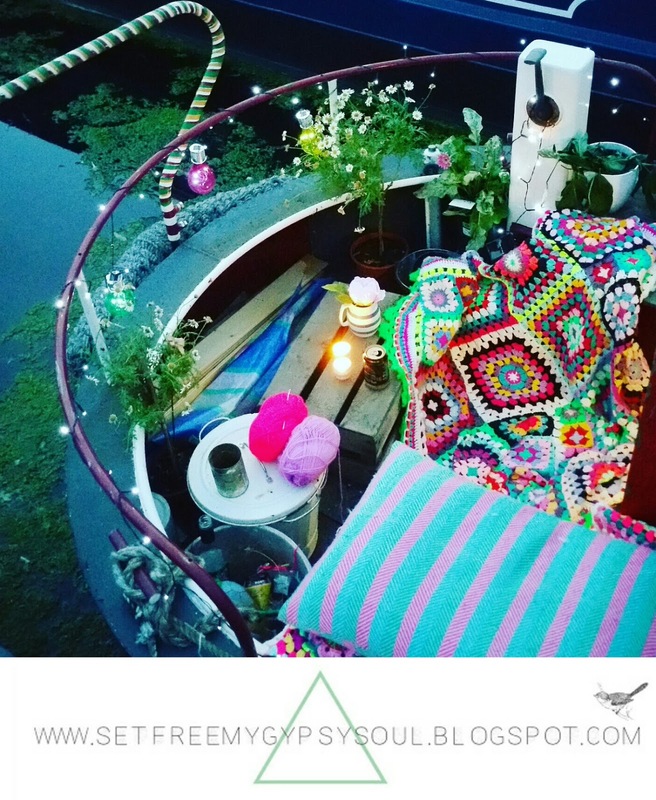 I am INCREDIBLY EXCITED to be writing this post from the deck of a Narrow Boat!!! We are on a mini holiday trying out our local Beckett's Park Marina... which is where we plan to moor our boat in the future... on my Uncle's 34ft Springer! It's amazing! Want to know why I am so crazy excited? Click here to find out about our #PROJECTLIVEABOARD mission. 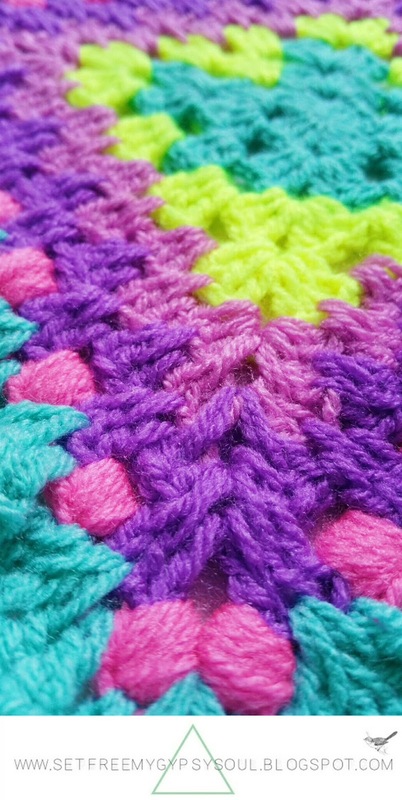 The Granny Heart Square is super cute and has been around a while now but I'm only just jumping on the band wagon. I've seen so many amazing variations of this design and when I saw Emma at Steel and Stitch''s awesome video I just had to whip one up quickly to see how cute it was in the reals. 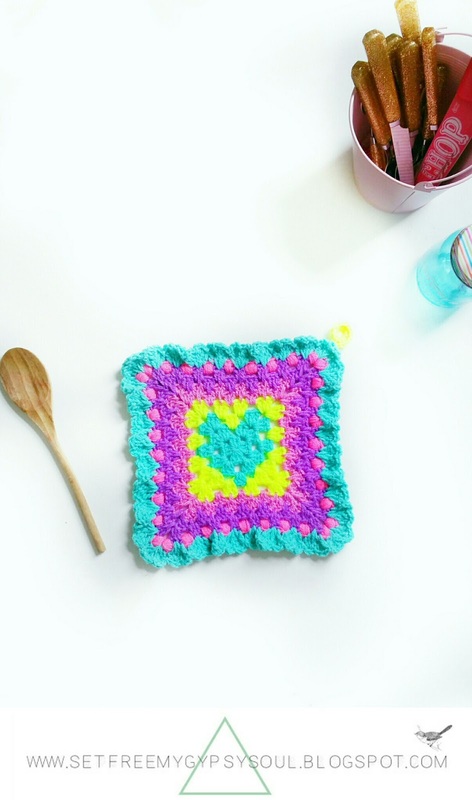 by making this fun Neon Granny Heart Square Pot holder! It's so quick and easy to make! Made using treble crochet (US double), spike stitch and puff stitch with a super frilly and ruffled heart shaped edging. Because a cute kitchen loves ruffles and frills!! I used a 4.5 mm crochet hook and DK yarn. Round 1: Start with a magic loop and chain 3. This counts as your first treble (US dc). Make 2 more tc into the loop and chain 2. Repeat 3 tc (US dc) into the loop and ch 2 three more times. Round 2: chain 5 and **make 3 tc (US dc) ch 2 and 3 tc (US dc) into the next space. Chain 1 and repeat ** in the next 2 spaces. On the last corner make 3 tc (US dc) ch 2 and 1 tc (US dc). This is where you will change colour for the first time so get ready! End the round with a final tc (US dc) and join with slip stitch. Now to get a nice clean colour change, slip stitch into the next space but swap your yarn colour as you pull through. Don't cast off your 1st colour, yarn A, hold it close to the back of your work with a nice tension and work over as when working over ends. Round 3: chain 3 with this new colour yarn, yarn B, which counts as your first tc (US dc). This is where we change colour for the first time in a treble stitch! So get yarn A ready again! Make one more tc (US dc) into the space and as you begin a 3rd treble into the same space with yarn over, pull through, yarn over pull through... before pulling through your 2 final loops, switch colour yarn. Now pull through the two loops on your hook and complete the stitch. You won't be casting off yarn B again though. Hold it behind your work at all times, close to your stitches ... this way to can work over it to make a neat back as when working over ends. Now chain 1 and make 3 tc (US dc) into the next space followed by ch 2 and another 3 tc (US double) into the same space. Chain 1 and make 2 tc (US double) into the next space. Change colour time coming again! So get your yarn ready! Begin a 3rd treble into the same space with yarn over, pull through, yarn over pull through... but before pulling through your 2 final loops, switch colour yarn. Now pull through the two loops on your hook and complete the stitch. Keep holding that yarn behind your work at all times, close to your stitches to make a neat back as when working over ends. Chain 1 and continue 3 tc (US dc) ch 2 into the next space. Coming up for a colour change again so again, make 2 tc (US dc) and on your final tc of the cluster swap back to your heart colour when pulling the final two loops through. Again, no casting off of colour B! Keep the yarn close to the back of your work with an even tension and work over. Chain 1 and make 2 tc (US double) into the next space. On your this treble stitch (US dc) change colour again on those last 2 loops. Ch 1 and make 3 tc (US dc) into the next space. Ch 1 and make 3 tc (US dc), ch 2, 2 tc (US dc) into the corner space... on your final treble of the round, change colour as you pull through those last 2 loops. Your heart design is now complete so you can now snip off yarn A leaving a tail. Just continue to work over the ends. Round 4: Ch 3 as your first treble (US dc) and make 2 tc (US dc) into the space. Ch 1. Continue around the work putting 3 tc, ch 2, 3 tc ch 1 clusters in to each corner and 3 tc ch 1 in each space. Round 5: cast on with a new colour in any chain space except a corner! Chain 3. This counts as your first tc (US dc). This round is spike stitch so for your second treble (US double) you poke your hook straight through the centre of the 2nd treble in the round below before yarn over. Make your tc (US dc) as normal followed by 1 regular tc (US dc) into the space. Chain 1 and repeat in each space around the Granny Heart. When you reach a corner as make your clusters and check 2 as usual but for that 2nd treble (US double) remember to spike down into the round below. Join with slip stitch once the round is complete. Round 6: chain 3 as your first treble and repeat round 5. Round 7-8: Cast on in a new colour and repeat 2 rounds of spike stitch. Round 9: Cast on in any space except a corner and make a 6 y/o puff stitch followed by a chance 2. Repeat in every space around the work putting 2 puff crochet stitches and ch 3 in each corner. 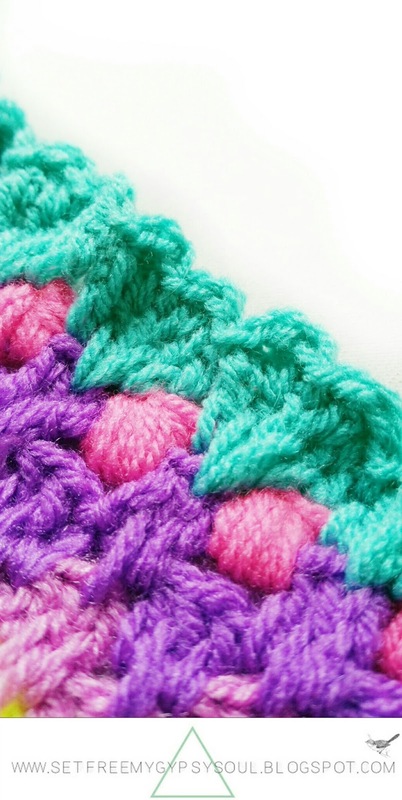 This super frilly edging is really simple to make. Made accross 2 rounds, its based on 5 stitches in each space and then topped with an almost double picot. Round 10: Cast on in any space between your puff stitches and chain 3 - this is your 1st tc (US dc). Then make a spike stitch down into round 8 followed by another tc (US dc). Into the same space now make another spike stitch down into the same space in the round 8 tc as you just made. Follow this with 1 more tc. Repeat this in each space around the work. Immediately make a HTC (US hdc) into the space between your treble and spike stitch. Then slip stitch into the centre of that centre treble. Make a HTC (US hdc) into the 3rd space and 2 tc (US dc) onto the 4th space. Slip stitch into the next space. Begin the pattern again. Work into every space around the work. Join with slip stitch, cast off and weave in ends. This is really simple and fast to complete once you get into the rhythm of it but if you have any questions about the stitch or need a demo please don't hesitate to contact me via Instagram @setfreemygypsys0ul or across social media. In the top right hand corner cast on in the back loops of round 10 and chain 8. Join with slip stitch into the same space. Now make 12 htc (US hdc) into the loop. 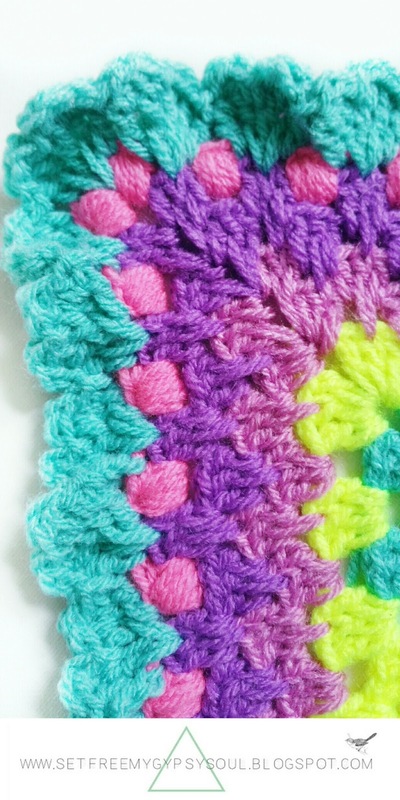 You can also use double crochet (US single). 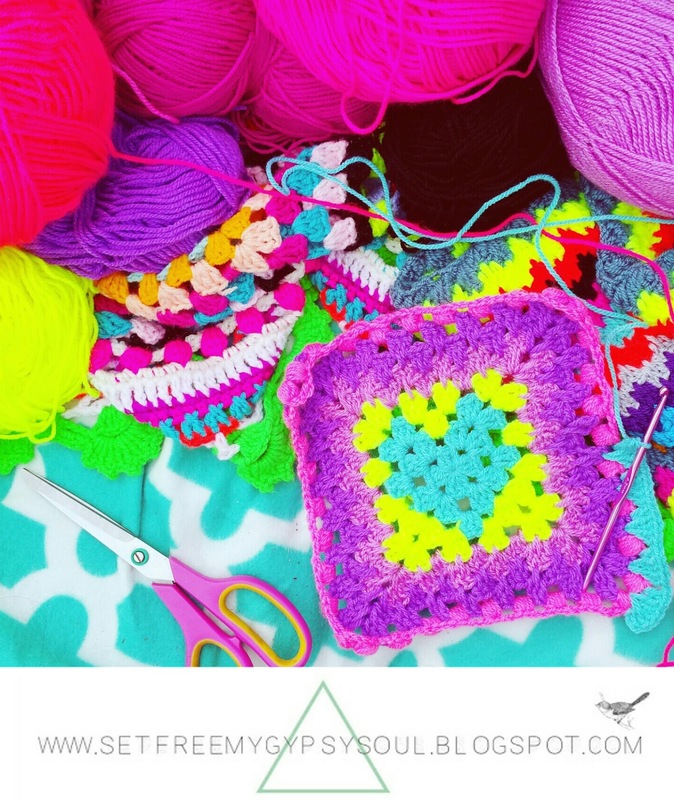 Join with slip stitch and cast off weaving in ends. And don't forget to show me your Granny Hearts on Instagram by tagging me @setfreemygypsys0ul or using the hashtag #SFMGS.